Sadie was born in 2010, and the relationship between Carol & Sadie is unique – as Sadie is actually Carol’s granddog! She belongs to the family of Carol’s daughter, where she resides as family member and best friend to Carol’s three grandsons. Carol & Sadie visit as a North Star Therapy Animals team at Park Nicollet Methodist Hospital on Tuesday afternoons. They spend their time in the Cancer Center visiting patients and their families, as well as on 4East – the Oncology and Hospice unit. Carol describes Sadie as 106 pounds of love and hair. Sadie is a gentle soul who knows her way around the hospital and loves to lie belly up on the floor by the Cancer reception desk so people can give her belly tickles. 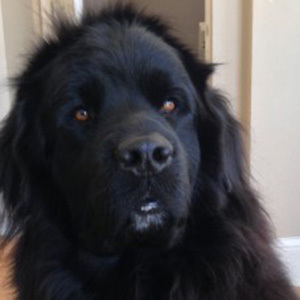 She is so well known at the hospital that patients request to see her because they have heard there is a “giant Newfoundland” there. Patients often tell Carol that hugging Sadie is just what they need to get through the day. The Cancer Center nurses have shared that when Sadie is in the unit they hear people laughing and telling stories about their pets – and that the energy is better. There is a lot of pain and sadness on 4East and in the Cancer Center, and Carol says it is very heartwarming to see how an oversized dog can bring smiles and comfort to people. At home Sadie makes sure to continue her loyal duties with Carol’s grandsons, where she watches them get on the bus each morning and waits every day for them to return home.